church williams | Sonic Smash-Music! 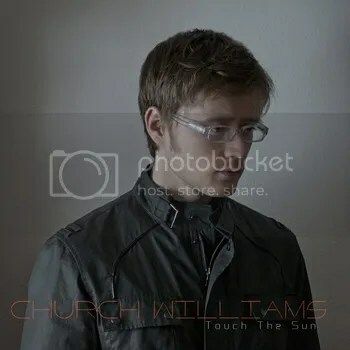 San Francisco digital music artist Church Williams has released his debut EP album, “Touch the Sun.” The record includes six original tracks from Williams, headed by the gentle giant that is “Touch the Sun” itself, the album’s title track and single. It is his first major release since his late 2012 release, the “Invisible Signs Remix EP,” which featured remixes of Williams tracks by artists such as Jumpshot, B. Smiley, and Sebastiaan Van Beest. With over 20 minutes of gorgeous orchestrations with which to introduce himself to the listening world, Church Williams has crafted an immaculate work of art in this, his debut record. A single as strong as “Touch…” would almost certainly have moved the scene in powerful ways on its own, bringing as much attention on Williams as his new EP already has, but a palpable, delicate beauty and depth of groove is consistent throughout all six of his tracks, making “Touch the Sun” a remarkably powerful first offering from this ambitious, young singer-songwriter. His instrumentation is clever, unique, and widely varied. Hardly any of the sounds heard in one song are utilized in another. Williams’ pieces are comprised of digitized keys, violins, chimes, guitars, and much more. His tone is warm and alive. No part of his album could not be realized onstage. Williams’ music is a work of great artistic integrity. The record was even mixed on a rare piece of equipment that tends to beautify anything it touches, the legendary API 1608. It was also mixed by an arguably more highly regarded musical engine: mix-master Mikael Johnston. The mastering was accomplished at Pyramind Studios, world-class music studio and learning facility, and home of the famous Test Press Event, which awarded Williams one of its highest accolades in 2012. To describe the actual sound of “Touch the Sun” is difficult, owing to the distinct character of the record. It is progressive pop electronica, with elements of trance and classical orchestration. In terms of vocals, Williams’ singing is natural and unpretentious, capacious in both range and ability, and his tasteful restraint lends an added quality to the music that cannot be faked. His lyrics are intelligent, meaningful, and free of melodrama or self-indulgence. Like a more spacious Depeche Mode with a dose of Robert Miles and a tiny dash of Siouxsie and the Banshees, Church Williams must be experienced to be truly imagined. Williams’ “Touch the Sun” will be a record everyone with ears hears sooner or later (and probably sooner) but music fans who don’t get in early will have done themselves a disservice. “Touch…” is a flawless record that promises to be the first in a long line of fantastic releases from Church Williams, and there’s positively no point in waiting.